Danu Forest’s new contribution to Pagan Portals is an unassuming jewel. Her Gwyn Ap Nudd gives the seeker-reader an all-access route to this ephemeral Celtic God. Gwyn ap Nudd is a Welsh deity about whom seemingly little is known, but the reader quickly learns that there is a rich folkloric tradition available to those who seek. It is our good fortune that in this case Forest was the seeker. I am a big Celtophile and had previously studied the Welsh mythological collection, The Mabinogion, so I was familiar with some of the things Forest covers in the book. However, a background in Celtic myth and Paganism is not necessary in order to get much from, and enjoy, Gwyn Ap Nudd. The introductory chapter gives an amazing account of Gwyn ap Nudd and some probable origins for the actual figure and his family, but also meanings for his name. My favorite chapter is probably chapter two: “Annwfn and the Realm of Faery.” Forest writes about Gwyn as he appears in the earliest Arthurian story, “The Spoils of Annwn.” She gives a faithful translation of the detailed poem, and, stanza by stanza, examines the religious and supernatural places (the caers, castles or forts within Faery) that Arthur and his shipmates go to and the place of Gwyn within the story. She concludes the chapter by examining the connection between the realm of faery and the realm of the dead, one which people familiar with Celtic myth will recognize as being intimately connected. I was very happy to read what she had to say about these realms being connected by Gwyn in his roles as lord of faery and master of the wild hunt. Being part of Pagan Portals, this book is necessarily short, but its length is perfect. 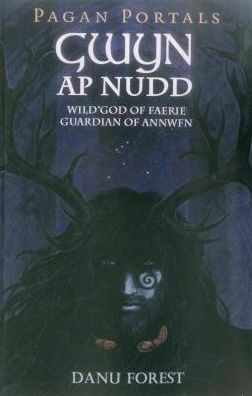 In five chapters, an additional introduction, and conclusion, we meet and work deeply with not only Gwyn ap Nudd, but other figures from his mythos; additionally, Celtic religious practices, like faery offerings and ancestral work, as well as more esoteric practices, like star gazing, are found in each chapter. This book is also enhanced by pen and ink drawings of Gwyn and others. I truly can’t recommend this book enough for anyone wanting to deepen their Celtic practices and knowledge.